A few of weeks ago I was lucky enough to take a tour around not one, but two nuclear fusion reactors. 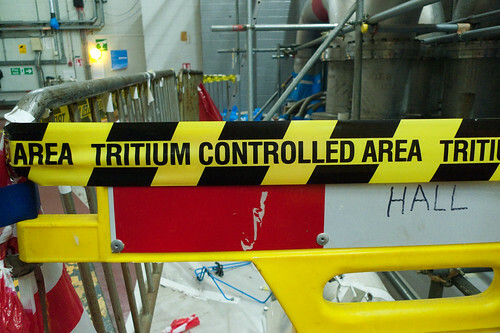 The Culham Centre for Fusion Energy is big science, British style. A non-descript science park outside Oxford, just up the road from a non-descript rural station. Say hello to the non-descript security desk, walk past the Civil Nuclear Constabulary vehicle (“Defend, deny, recover.”), into the type of building that university engineering departments built in the 70s do so well. First, some science. The largest fusion reactor we have is the Sun. Fusion generates energy by smashing together two isotypes of Hydrogen, Deuterium and Tritium at high enough temperatures that they overcome their electromagnetic repulsion and fuse together. This fusion results in a heavy helium isotype and a free neutron with lots of energy. This excess energy is then used to turn water into steam, which drives turbines and creates power on the grid. Easy. The sorts of temperatures/energy required to overcome electromagnetic repulsion are high. The Sun’s core is about 15 million Kelvin, but due to the smaller size of an Earth based reactor, we’d need to get to about 200 million K. At those sorts of temperatures, the fuel becomes plasma, a state where the electrons are free moving. 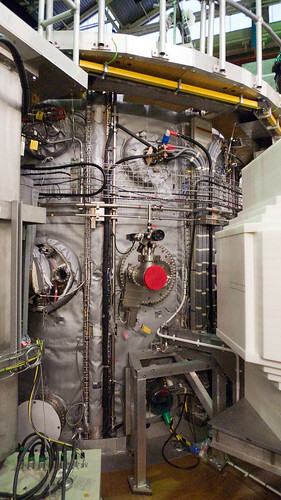 Culham has two different experiments, MAST (Mega Amp Spherical Tokamak) and JET (Joint European Torus). These are both Tokamak-type reactors, named after the torus (doughnut) shape used to contain the plasma. To maintain the energy levels required for the reaction, the plasma must be contained in a magnetic field. If the plasma touches the sides of the torus, it’ll lose energy to the walls. Managing this containment is one of the most difficult bits, and was described by one of the scientists as like “holding jelly with elastic bands”. 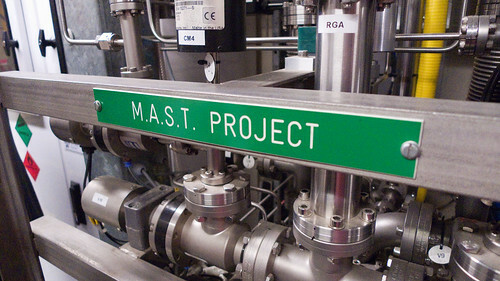 MAST is the British experiment, and the one I visited first. 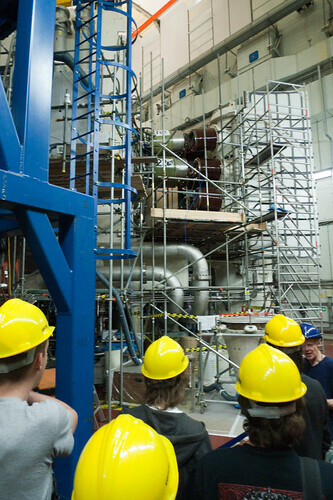 Its goal is to learn how the Tokamak design behaves, and to experiment with magnetic field designs and strategies. It’s in a large warehouse, full of narrow corridors, meshed wire fencing and flashing hazard signs. Just looking at it is complicated. Every space is covered with sensors, pipes and wiring. Despite not being very big (maybe the size of a small truck) you can’t really take a good photo of it. Oddly, it feels a bit weird to watch the videos from inside MAST. 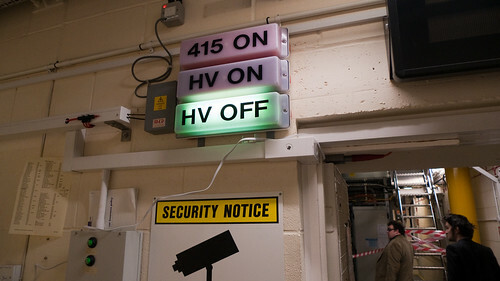 There’s something about the combination of these being taken in the visible light spectrum inside a reactor, at super high speeds, with a CCTV-like aesthetic, makes me feel like I shouldn’t be able to observe what’s going on. Somehow reams of sensor data is fine, but watching the actual reaction feels… wrong. Like you’re looking into the soul of something amazing. Its main goal is to develop the complete reactor design into something that can be scaled up for future designs that can produce power. At the moment JET can produce power, but less than they put in. Scale is a limiting factor – the next Tokamak reactor, ITER (International Thermonuclear Experimental Reactor), scheduled to be built in France in 2018, is double the size of JET in every dimension and should produce a net positive energy output. ITER will be based not just on JET, but also all on the other experiments around the world. It’s a genuinely pan-global project, with China, the EU, India, Japan, Korea, Russia and the USA all contributing. 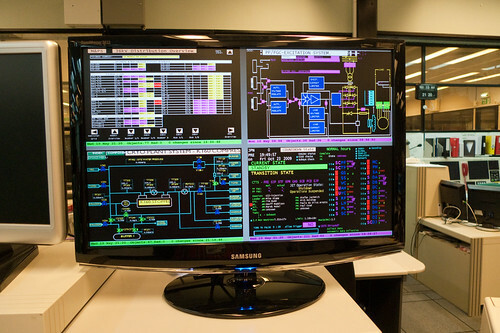 After that, DEMO will be the first reactor connected to the grid producing power continuously. But that’s not scheduled to enter operations until 2033. The first, that the way they describe the problems and solutions is much more like I’d expect engineers to talk, than physicists. They talk about pushing the plasma around with magnetic fields, and sub-lightspeed particles in the way that I’d expect a team of engineers to talk about carburettor design. It doesn’t mean I understand it any more, just that it’s much more practical and hands on than I expected. And the second was that this is something genuinely inspirational. Big science, funded from numerous countries, to create something potentially human-race saving for our future. We should be proud. Which is why the recent news that ITER might have its budgets cut or even be cancelled is so disappointing. 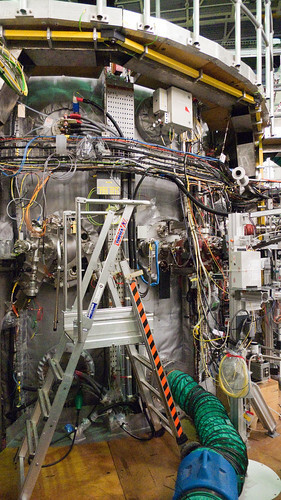 Fusion is exactly the sort of long-term, grand vision project that we need right now. For it to be delayed or even dashed because we broke our pretend money system is, frankly, gutting. But let’s hope not, and let’s hope our children’s children will have a little piece of the sun’s core powering their lives. 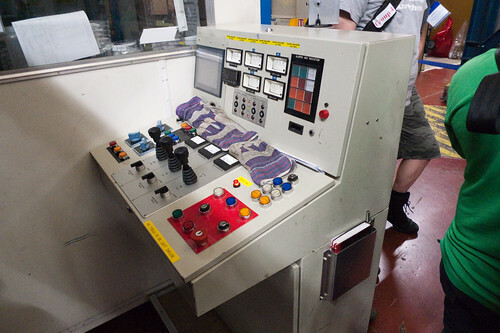 Big thanks to Culham Centre for Fusion Energy for putting on the tour, and everyone who gave up their evenings to let us wander around asking stupid questions. The rest of the photos on are Flickr.